I've been pretty frustrated with the way images appeared in my blog, making most of my comics unreadable unless you clicked on it to open the full size image in a new window/tab. Finally, after a few complaints about my last post, I decided to take some time to fix it. So I switched over to Edit Html and found 2 interesting things. For my post blogger set the image size to 400px x 160px, really to small to read. I simply adjusted that up to 600px x 250px But then I got a large fuzzy image. That lead me to this second bit. 2) Blogger/Google creates a custom preview image at that scaled size. So you need to adjust your link to point to the original image and not the preview. Great right? Wrong… Depending on your blogger template your post is probably now being cut off because it extends beyond the Post border. I found a quick easy tutorial at BlogBulk that shows how to edit your template to widen your blog. I've set mine now for a total size of 750px. 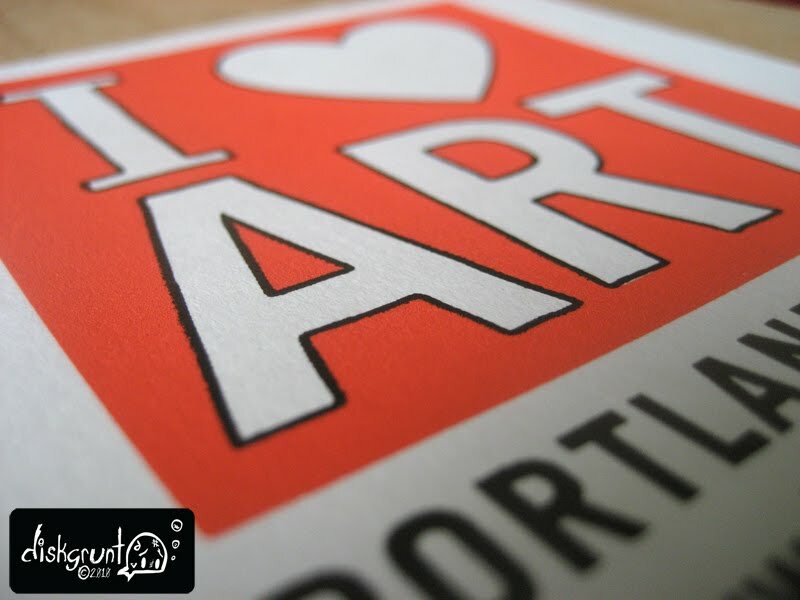 This expands the post area to 600px and squeezes the side bar down to 120px. Let me know what you think of the changes. I'm editing some of my more recent post so they fit this new standard better. I just got back from visiting family in Illinois, and I have to say the amount of beef and cheese I ate was pretty absurd... I think I'm lucky to live where I do, there's so many healthy options for groceries and restaurants and a culture that promotes both eating right and respecting where your food comes from. My whole visit, I kept thinking about Food Inc., but there didn't seem to be much of a choice if you didn't want mass produced food. 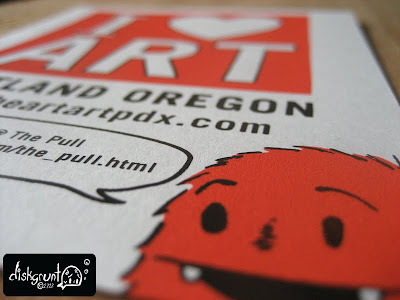 I Heart Art PDX is a unique collaboration between Etsy.com, PNCA, and the Museum of Contemporary Craft that's goal "...is to support and advocate for Portland’s vibrant community of makers by fostering dialogue, inspiring activity, and offering access to resources that are otherwise difficult to find." I was approached by Isaac Watson on doing some promotional flyers for them to hand out during this weekends "Super Colossal Spring Sale" that Crafty Wonderland is hosting at the convention center. 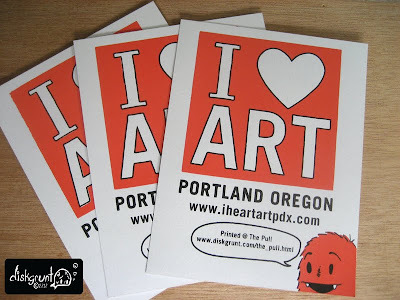 Given that I missed the registration deadline for the craft fair, I thought this would be a great way to get some exposure there for my press, The Pull, while helping out the I Heart Art PDX organization there. Everything about this project was done pretty last minute and in the middle of another print job. I was supplied the logo artwork and ended up creating the lil' monster illustration and adjusting the flyer layout to fit all the elements in. Once the design was done I was able to get 300 flyers printed in about 9 hours. That's not the fastest I've done, but but given I was working on my own, and throwing in a flash dry between color hits, I think I did pretty well time wise. If you want to get one, be sure to swing by Crafty Wonder Land this weekend and visit the I Heart Art PDX table. On the back of the flyer are dates for various workshops being hosted throughout the spring and summer. 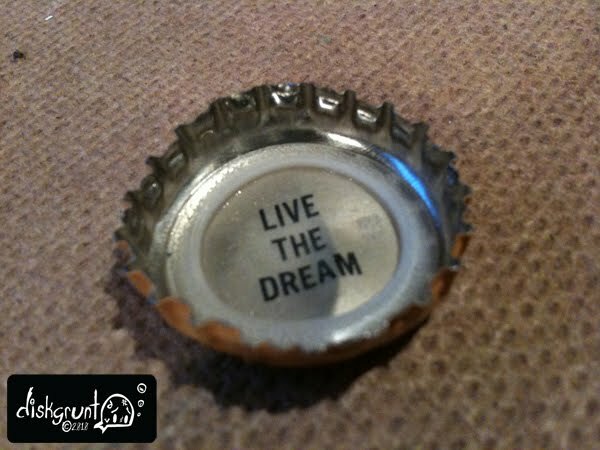 When I finished up my print job and started cleanup, I cracked open a Full Sail "A Light-Bodied Nonetheless Hella Good Limited Edition Lager" and was greeted with a very satisfying message.